Suffice to say, no-one was happy with this state of affairs and I ended up with a 1-5 record and not making it to the knock-out stages. Next time will see a return to Draft so I will give some quick thoughts to my first picks in Theros Draft (common and uncommon only). This is not the view of an expert, and I’m behind the curve as Born of the Gods is now out, it is merely an exercise to clear things up in my own mind. This seems to be a sought after colour in our group’s draft, mainly thanks to the groovy battle tricks of Heroic and cards such as Dauntless Onslaught which combines fantastically with the Heroic ability of cards like Phalanx Leader which gives a +1/+1 counter to every one of your creatures. 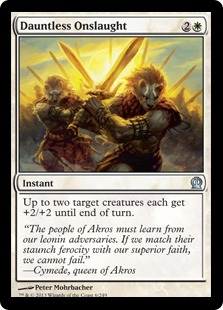 In conjunction, these two cards can make your horde extremely difficult to cope with, but the ww cost of your Leader requires white to be the main colour as its frustrating having this in your hand without the land to cast it. Phalanx Leader is definitely a first pick if you think you’ll be drafting the cards to target him, and if there are more Heroic creatures knocking about then Dauntless Onslaught is a high pick too. 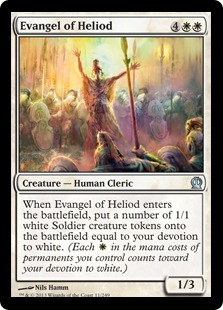 If you’re running a high devotion to white, a couple of Phalanx Leaders makes Evangel of Heliod a decent pick. 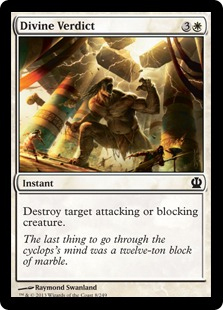 With the numerous enchantments in Theros, Ray of Dissolution is a high pick, especially as it doubles up as creature removal on enchantment creatures. Divine Verdict is a must if you happen upon it as it can mincemeat your opponent’s 9/9 Monstrous, Trample beast or allow you to blast a roadblock out of the way of a beast of your own. It can be a late-game, game-winner. A copy of Vanquish the Foul is worth drafting for the same reason. It’s expensive, but if you opponent gets something monstrous onto the battlefield, it may be necessary. 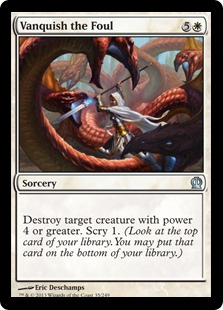 White doesn’t have much creature removal so these cards come in quite handy. 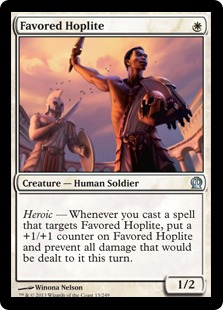 Favoured Hoplite is nice for 1 mana as he’s 1/2, and can be saved AND boosted with his Heroic ability by a single spell. 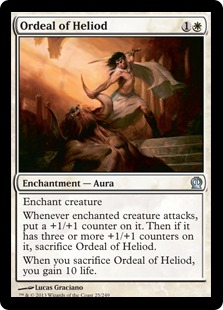 Ordeal of Heliod is nice, especially if you’re running a Heroic deck and a creature already has +1/+1 counters on it as it can be an instant life boost if you’re in a desperate situation. Ok. We all hated it apart from Zanfus AND Alex!